No BS Brass! and DJ Geko Jones. For the past few years, Barbès has been presenting a Manhattan showcase timed to coincide with the APAP conference – an annual rite which, every January, brings musicians from around the world to New York. This year, Barbès has teamed up with fellow brooklynites, label Electric Cowbell, to bring a particularly exciting roster to the always suspect borough of Manhattan. Electric Cowbell is a new record label dedicated to release 45rpm seven inch vinyl of new talent (from the Debo Band, to Talibam!, Khaira Arby and Superhuman Happiness). Like barbès, the label doesn’t believe distinctions of genre are always pertinent and promotes like-minded musicians who operate in mediums as varied as Funk, Afrobeat, Latin psychedelia, Balkan music or Second Line brass music. Barbès is a Brooklyn club which, next spring, will be celebrating ten years of eclectic programming – from classical string quartets to Ukrainian polyphonies, Forro and American Qawwali. This edition of our Manhattan invasion will feature the congolese musings of Smokey Hormel, the electric cumbias of Chicha LIbre, the improvisations of Malian griot Cheick Hamal Diabate, No BS! 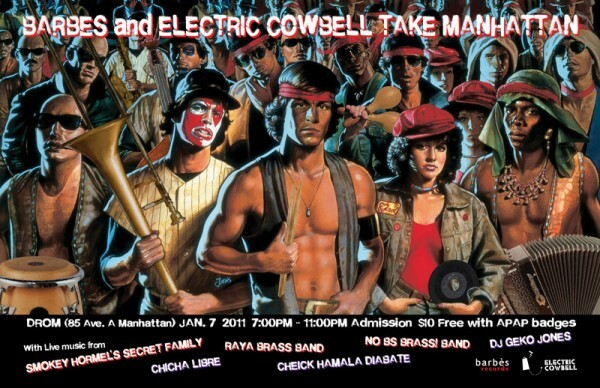 Brass‘ brand of funk, the Brooklyn Balkan hybrid that is Raya and the Pan-latin tropical sound of DJ Geko Jones. A powerful brass band from Richmond VA that infuses the spirit of New Orleans into its original East Coast modern funk. They draw inspiration from funk, jazz, klezmer, calypso, and Led Zeppelin and while most members have conservatory training, they strive for heart-pounding energy and uncontrollable dancing. Cheick Hamala Diabate is a Malian griot and a master of the ngoni, a traditional instrument. He started his career at a young age playing with Malian musical greats, including Toumani Diabate (a first cousin), Oumou Sangare, Ali Farka Toure and Salif Keita. Upon coming to the US, Cheick Hamala was intrigued by the resemblance between his ngoni and the American banjo, even sharing tunings and picking styles. He has since learned to play the banjo at a virtuosic level, including collaborations with Bela Fleck and Bob Carlin. Cheick’s album of banjo duets with Carlin, From Mali to America, was nominated for a grammy in 2007 for Best Traditional World Music Album. Chicha LIbre is a Brooklyn collective made up of French, American, Venezuelan and Mexican musicians who mix up covers of Peruvian electric cumbia with original compositions in French, Spanish and English, re-interpretation of 70’s pop classics as well as cumbia versions of pieces by the likes of Satie, Love and Joe Dassin. In the past year, the group has brought its music to Istanbul, Madrid, Berlin and Copenhagen, but has been especially welcome in South America where its mix of Tropical experimentation and psychedelia has proved extremely popular. Chicha Libre’s second album is a psychedelic bender with a majority of original compositions and nods to Wagner and Los Mirlos. It will be released by Barbès Records and Crammed disc in April of 2012. Raya Brass Band gleefully mashes up the music of Eastern Europe with funky American dance grooves. Featuring odd meters, unusual scales and a fine helping of gorgeous Balkan and Romany (Gypsy) melodies played on reeds, trumpet, accordion, tuba and drums, Raya Brass Band slakes the thirst for something old and new at the same time, unusual and catchy, spiritedly played by some of NYC’s finest Balkan folk musicians. Greg Squared (clarinet), Ben Syversen (trumpet), Matthew Fass (accordion), Don Godwin (tuba) and EJ Fry (tupan). Geko Jones is a Brooklyn-based Puerto-lombian DJ and Producer. He is a founding member of both the New York Tropical and Que Bajo?! party franchises in New York. He is also a partner and co-owner of the Dutty Artz record label with producer Matt Shadetek and DJ /Rupture. His mixes span the tropical hemispheres and collage together globally sonic hours of dancefloor mayhem. Renowned by top DJ’s and producers of the digital cumbia scene in Latin America and European bass-pundits alike, Jones is one of the select few DJ’s pushing forward the Latin agenda in a world wide tropical bass scene. The past five years have found him sharing a booth or collaborating with a long roster of A-list globalistas like Uproot Andy, Radioclit, ZZK, Maluca, Dub War, Toy Selectah and more. Notes: BARBES and ELECTRIC COWBELL TAKE MANHATTAN at DROM With Smokey Hormel, Chicha Libre, Raya Brass band, Cheick Hamala Diabate, No BS Brass! and DJ Geko Jones.